Liv'n Like a Man is the kind of CD that we had hoped to hear from Orrin Bolton. Three years in the making, this long-awaited offering is an intimate, autobiographical journey woven with strong vocals, percussive grooves, and memorable, melodic refrains. Liv'n Like a Man highlights OB's diverse songwriting style, and it gifts us with the refreshing afterglow of a delightfully honest, entertaining experience. This collection convincingly reflects O.B. 's love, respect, and grasp of multiple musical genres. 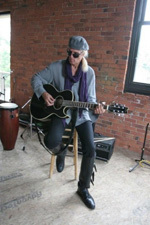 From the first track "Don't Cry Baby," one is drawn into the songwriter's world, supported by OB's soulful, vulnerable voice. His personal struggles with commitment and loss are met head-on in "The Promise" and overcome, at long last, by what still rings true in his world -- love and fearless commitment to one's values. Other suggested tracks include "Keep Me Call'n," "Homefire," "Liv'n Like a Man," and "Don't Let the Last Word be Goodbye." 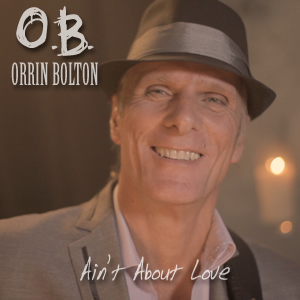 Possessing the family gift of songwriting and a strong, familiar vocal prowess, Orrin Bolton is one singer/songwriter strutting his own style and his uniquely positioned perspective as a life long citizen of the world. Originally from New Haven, Connecticut, OB was born to travel and earned a reputation early on in European circles as "the polite American." By the time he was nineteen, he was the lead singer of the Dutch band "Jelly Roll Jam" bringing American R&B roots to his live performances at the popular clubs in Amsterdam. At age 21, he was asked to join his brother in LA and was signed to Al Schmitt's label, Pentagram records. Moving later into artist management, at age 24 OB is credited with securing his brother Michael's first major recording contract with RCA records, and with the creation of Avocado Music publishing. A decade later, while energizing and delivering projects for a host of music industry clients, OB developed his unique "independent" project assist service, Oroco Support Services. OB founded his indie label Rock'n Hood Records in 1991, and he later released his solo debut CD entitled Freedom. The title cut was immediately licensed by High Times Magazine and the anthem ushered in the return of the rural protest song. Orrin is also the author of a number of books, including Confessions of a Soda Jerk (a cautionary, self-help, graphic novel skillfully designed to assist young people in confronting and overcoming hard drug abuse) and Vagabond (based on the adventures of two brothers and their odyssey from Afghanistan's Khyber Pass to the Rock'n Roll highway).